Muiden is a small fortified town. During the high season, months April – August, it is not advisable to try and find a parking space in the centre of the town. Luckily Muiden offers enough parking space just outside of the centre. 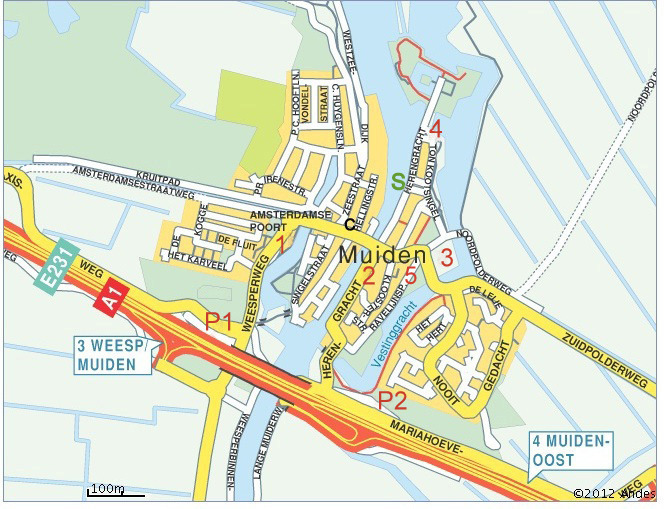 Muiden is also very easy to reach by public transport. The berth of the ferry ‘Stern’ is opposite no.33 Herengracht in Muiden. Located on the map at the green ‘S’. P1, P+R Terrein Maxisweg, directly on the north side of the highway A1. Exit 3 Weesp/Muiden. Good for 167 parking spaces. P2, Mariahoeveweg, directly on the north side of the highway A1. Exit 4 Muiden-Oost. Good for 145 parking spaces. Rate between 09:00-21:00 hours €1,- per hour. A day ticket costs €7,20. P1 – 5. Rate between 09:00-21:00 hours €2,40 per hour. A day ticket costs €21,60. Note: Payment only using debit card, credit card or mobile services like Yellowbrick, Parkline or ANWB Parkeren. The route from the parking place to the ferry is indicated by signs. 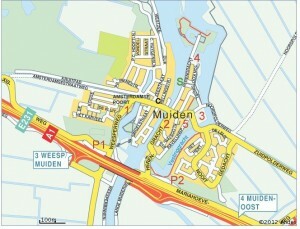 It takes approximately 10 minutes to walk from the parking space, through the attractive centre of Muiden to the ferry. Note: The parking meters only accept debit or credit card.. We advise you to use a mobile service like Yellowbrick, Parkline or ANWB Parkeren. This way you will never pay more than needed and you will be flexible in choosing your departure time from Pampus. Take the train to NS station Weesp. From there you can take the bus, no. 110, to the bus stop ‘brandweerkazerne Muiden’. This stop is located on the map at 1. Take the train to NS station Amsterdam-Amstel. From there you can take the bus no. 320, 322 or 327 to bus stop ‘P+R Terrein Muiden’. This stop is located on the map at parking place P1. From the bus stops: walk towards the centre of Muiden and cross the lock, afterwards you turn left. The ferry ‘Stern’ lays approx. 200 meter further.